The Sendai-tansu our predecessors have wholeheartedly protected and developed is the accumulation of Japanese beauty and technique that over time has become the fascination of many. Even with the current trend to streamline, there is a desire to communicate to the future what our predecessors have built up the value in the work done by hand. A Monmaya craftsman was interviewed on his thoughts about crafting by hand”, the essence of the pride and responsibility of a well established store. Q１. Why were you able to continue for 60 years? Even with the same tansu there are many forms, there was it was interesting to work every time. It is as if very time I make something there is a new discovery. Q２. What is the appeal in making Sendai-tansu? With tansu making, you have a natural material that is wood as the opponent so no matter how many times you do it, it won’t turn out the same. What is important above all is planing. In the past there was an amazing master* who had roots in Edo sashimono**. At the time all the innovative products were his ideas and it is still popular with customers now. I couldn’t plane like the master so I learnt from continuously and repeatedly observing him. *The previous head of the workshop, Genjiro Aoyagi. Aoyagi referred to as “master” is said to have his roots in Edo sashimono, was best at delicate but elegant designs and together with the third successor Tamizo designed many products that remain to this day. ** Edo Sashimono refers to the woodworking joints and items made from that in Edo (present day Tokyo) area. Q３. As a craftsman what do you feel or keep as something important? Tool making***. In the past I cut times for meals or sleep to do so. Also, in the end it is important to make the customers happy. It’s to work meticulously. In cutting away carefully, it is easier to lacquer and it becomes beautiful. If the lacquer is good, putting on the metal parts goes smoothly too. Every procedure is connected. The experience of the entire past 60 years is alive in the work done day to day. 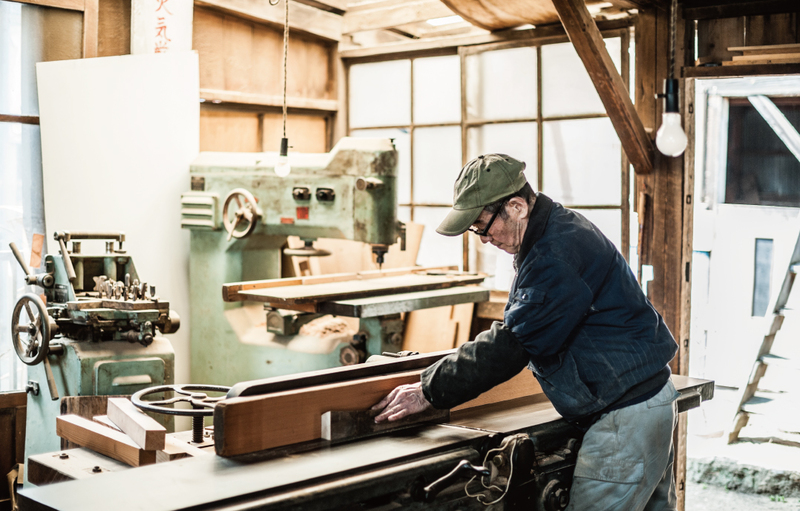 Even the few years of doing small tasks, the desk and stool made under the instruction of a western furniture teacher, the techniques in making cupboards, the times spent just watching the master are all alive. Q４. Thoughts on the Monamaya of tomorrow? I think young people should make more and more. Right now we are challenging ourselves to make new products that fit the modern lifestyle but there are some things I can’t do. Even if there are awkward jobs there are techniques to be learnt and developed in the process. Whilst doing something new it would be great if I can pass on techniques to the next generation. ***Each craftsman has his own (curated) tools. Even with a chamfer plane the blade is adjusted or the base is made in order that it is easy to use. To be able to make one’s own tools is another skill of the craftsman. Copyright © MONMAYA. All Rights Reserved.